A 3-ingredient (so you know it’s healthy) sundae. Strictly for grown ups. And for those who want to say diet be damned! 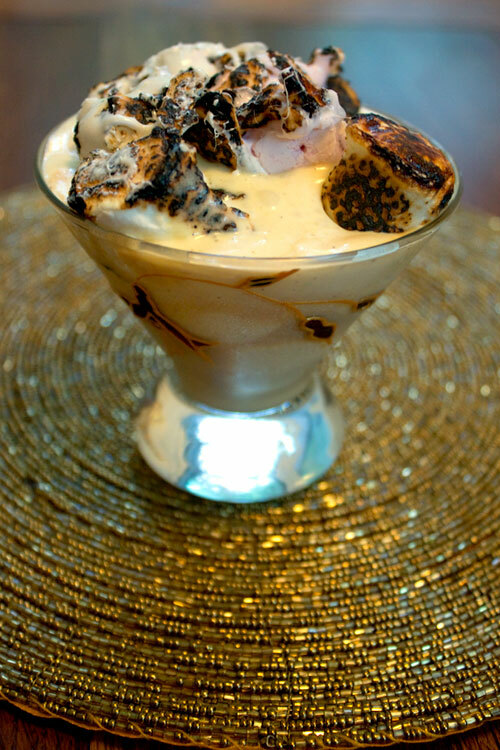 A toasted marshmallow sundae that’s strictly for the grown ups – and is in no way, shape or form healthy. I love marshmallows. They are one of my pig-out foods. So I was kind of intrigued by some recipes I came across lately for toasted marshmallow smoothies, but I wasn’t grabbed by any that I saw because I wasn’t crazy about what they were paired with and most times the marshmallows didn’t appear to be really toasted. For me, unless the marshmallow is toasted on all sides and mostly just goo on the inside it cannot really be called a toasted marshmallow. Yes, I take the issue of toasting marshmallows very verrry seriously. So then I started wondering what kind of a toasted marshmallow smoothie would I find appealing. I couldn’t think of any sort of smoothie that would work but I thought toasted marshmallow might taste great with vanilla ice-cream and Bailey’s. I wasn’t sure how to toast the marshmallows and transfer them on to the sundae without breaking and smushing them and ending up with a gooey mess rather than nice rows of toasted marshmallows. I guess the pictures kinda give away the ending but let me just tell you the beginning – I decided I had to get a blowtorch. 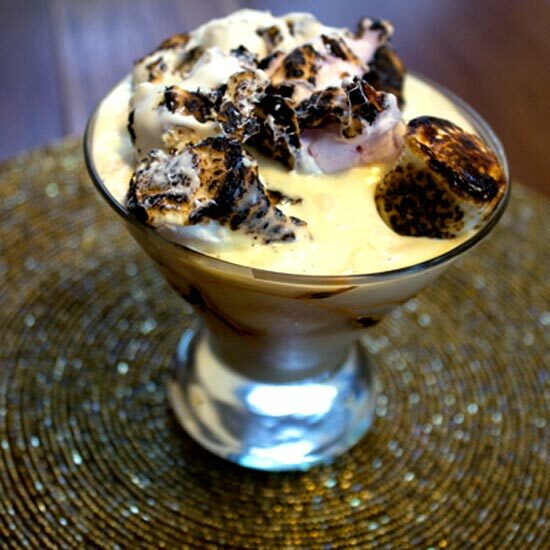 I have wanted to get a blowtorch ever since I saw this recipe (doesn’t it look gorgeous!) but when I tried to order one from amazon they wouldn’t deliver it to my address (they still won’t, and I’m now at a different address, what’s that about?) and I couldn’t find any in the local stores at the time and since I only wanted it for one recipe there didn’t seem to be much point searching out where to get blowtorches in Dublin. But now I had two recipes that required a blowtorch so the search was on. Woodies DIY is where you get them if you’re interested. But they don’t carry the gas, well at least not the one in Sandyford. I had a bizarre conversation with one of the managers or supervisors who told me it could only be sold from behind a counter and I was like “But this is a shop. You have counters.” “No. It has to be behind the counter. Do you see?” I didn’t really. You can buy the gas at any newsagents. I got some at the Londis down the road from Woodies. Armed and most definitely dangerous. I’ve given my car to someone for a couple of months to try and convince them that they should keep a car, and I also had this idea that it would force me to exercise more and so get me fit. What’s happened is the person hasn’t used the car at all so they are more convinced than ever that they don’t need one, I’ve discovered that I now have hay fever so instead of feeling good with all this exercise I actually feel wiped out, I discovered that my bike is possessed by a demon that is determined to destroy me – slooowly (the gears have stopped working and I’m stuck in one of the heavy ones), and I’ve discovered that the route from my apartment to Sandyford is all up-hill. But I now have a blowtorch! 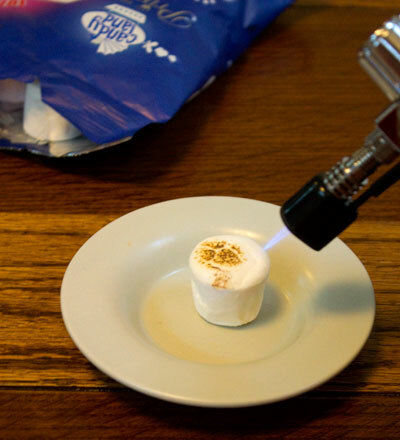 Turns out though that blowtorches are not great for toasting marshmallows. They’re great at caramelizing the surface of things, but for a properly toasted marshmallow you want that sort of heat that heats them through, not just burning the outside but also puffing them up with goo. Very seriously. Hmm, this is a bit underwhelming to say the least. 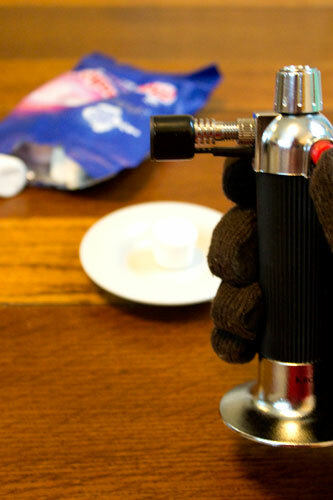 Yep, that’s what you get toasting marshmallows with a blowtorch. A patch of burntness. That’s it. 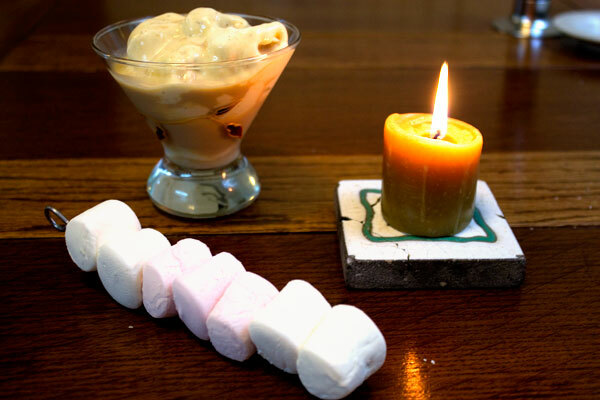 So, yes you toast the marshmallows the normal way and then put them on top of the sundae whatever way you can. And although this looks a mess, provided you have a very sweet tooth (I do), this works really really well. And if you cycled uphill for half an hour in a gear that was made by dark forces then you deserve every single calorie – and then some! Yes. 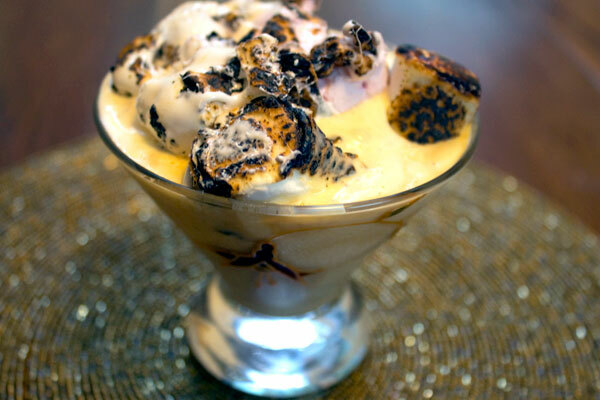 Now you’re possibly thinking that it would look better if the whole top of the sundae were covered in gooey burnt marshmallows. And I think you’re right. – I did buy 4 packets of marshmallows for this little experiment. Unfortunately I had already eaten 3 and half packets by the time I got around to making the sundae. (The bike made me do it. It’s evil.) So that’s why I’m saying “1 packet marshmallows” in the ingredients, even though I just had 7 on the top of mine. Yes, it’s really really really high in calories. I could lend you my bike if you need to burn some calories (through the fires of hell – okay, I know I need to let it go – or just buy a new one – or even just get the damned (literally) gears fixed – I just keep forgetting to). 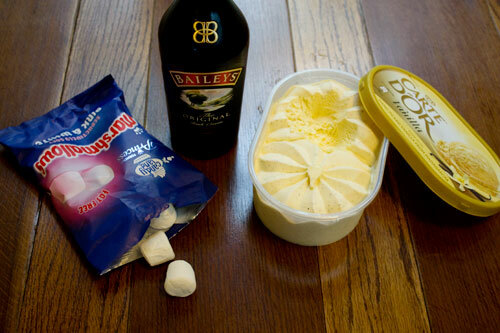 Into a suitable glass or small dish add 2 to 3 scoops of vanilla ice-cream and pour over a shot of Bailey’s. 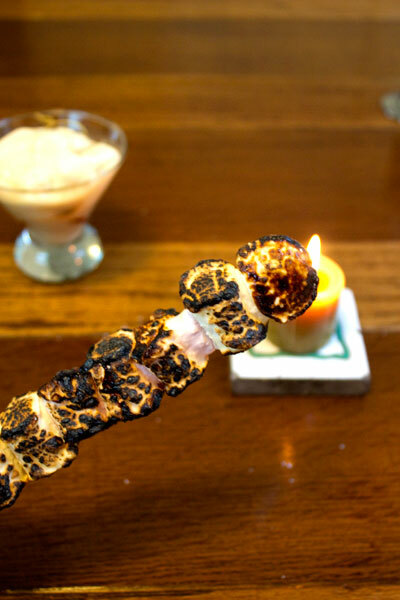 Pile up a skewer with marshmallows and toast them either over a BBQ, gas ring on the cooker or over a candle flame (you should really use plain, uncoloured, unscented candles for this – unfortunately I didn’t have any of these to hand). 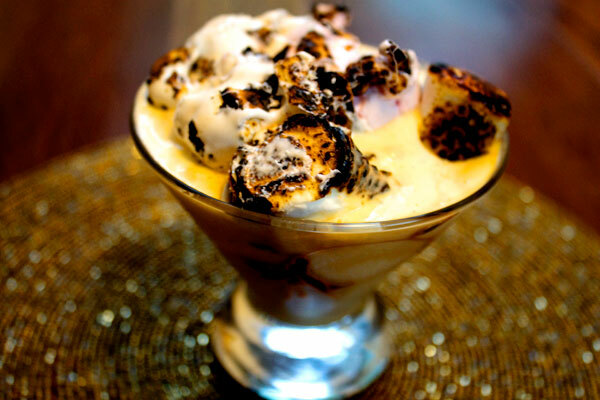 Top the ice-cream with the marshmallows whatever way you can. You could toast these over a bbq or the rings on a gas cooker. Not having those I opted for a candle – what I usually use to toast marshmallows. Now those are some properly toasted marshmallows. So one of the problems with properly toasted marshmallows is that they are extra soft and gooey so getting them off the skewer is not so easy… One of them was perfect. There’s always one. “Holy disco balls Batman! What is that!? !” “I – don’t – know. I just – – don’t know.” … … OK I don’t know what’s up with colour settings on my home computer but this looks very trippy there. Whereas on the computer at work it looks just slightly different to the one above. I should have said – this isn’t just a mess to look at, it’s also quite messy to eat. But sometimes messy is good, right? Or is that just the scented candle fumes talking? By the way, if I ever do get around to making that divine looking Berry, Mascarpone and Coconut Cake, I’ll post a pic of it here. Jan 2017 Update: The brand of marshmallows I used here changed their recipe – and so I wouldn’t recommend these ones anymore. I’m half afraid to say which ones I do like now in they also change their recipe. – Why does that happen, you find something you like and they either change it or stop selling it? Why did Sara Lee stop selling that frozen pecan danish pie thing? I want to know. Seriously. … Yes, Even years later. Yes, even though I no longer eat gluten. I want to know. 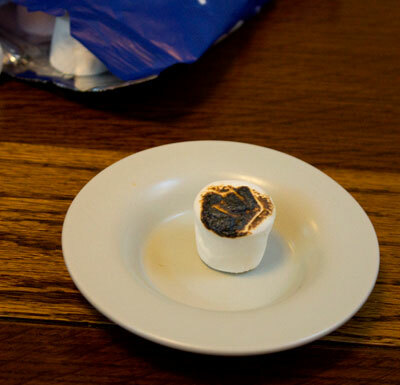 … Well anyway, it might do me good if there aren’t any suitable marshmallows left, Marks & Spencer’s own brand marshmallows are good. For now.